The NBA All Star Basketball DX Arcade Machine is a sports themed arcade game that dispenses collectible NBA All Star cards as prizes! These cards also give the players extra points, time, or other in game advantages! 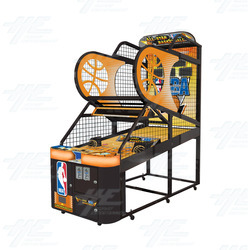 This exciting basketball sports game has a unique card feature that will make this machine a stand out in any location. There are 150 collectors cards in total (100 normal cards and 50 'Metal' cards), which players receive when they play the game. The cards feature NBA players and each has its own feature reward, such as 'Add 10 secs' or '1 Extra Pt per Goal for 10 secs' etc. The idea is that players can use their cards throughout the game to assist them. There are two sizes for the machine, which comes in either the full adult size or 3/4 size kid version (featured dimensions are of the Kid size). This makes the machine much more versatile and suitbale to a wider range of locations! There are four stages to the game, and players must reach certain goal scores in order to pass each stage. These include: - Stage 1: Get 40 points to advance to the second stage. - Stage 2: Get 150 points to advance to the third stage. - Stage 3: Get 250 points to advance to the fourth stage. - Stage 4: Final Challenge, get as many points as you can in a limited time. The NBA All Star Basketball DX arcade machine is a licensed product from Sealy, with 150 collectible cards to be won, and chances to win additional prizes too! The cards, of course, have their rules as well. The Card Reward Rules include: - Player gets a card when he/she scores higher than the given score. - Player gets another card when he/she breaks the record. - In online mode, winner gets one card. - More rules can be programmed as required. The NBA All Star Basketball DX is an exciting prize machine, card game, and sports arcade machine - all rolled into one! It is a game that can be enjoyed by players of all ages and will earn well in a wide variety of locations, such as street locations, arcade rooms, and nfamily entertainment centers. The NBA All Star Basketball DX Arcade Machine is a sports themed arcade game that dispenses collectible NBA All Star cards as prizes! These cards also give the players extra points, time, or other in game advantages! This exciting basketball sports game has a unique card feature that will make this machine a stand out in any location. There are 150 collectors cards in total (100 normal cards and 50 'Metal' cards), which players receive when they play the game. The cards feature NBA players and each has its own feature reward, such as 'Add 10 secs' or '1 Extra Pt per Goal for 10 secs' etc. The idea is that players can use their cards throughout the game to assist them. There are two sizes for the machine, which comes in either the full adult size or 3/4 size kid version (featured dimensions are of the Kid size). This makes the machine much more versatile and suitbale to a wider range of locations! Stage 1: Get 40 points to advance to the second stage. Stage 2: Get 150 points to advance to the third stage. Stage 3: Get 250 points to advance to the fourth stage. Stage 4: Final Challenge, get as many points as you can in a limited time. Player gets a card when he/she scores higher than the given score. Player gets another card when he/she breaks the record. In online mode, winner gets one card. More rules can be programmed as required. The NBA All Star Basketball DX is an exciting prize machine, card game, and sports arcade machine - all rolled into one! It is a game that can be enjoyed by players of all ages and will earn well in a wide variety of locations, such as street locations, arcade rooms, and nfamily entertainment centers.